I freely admit that I'm a sucker for glowing neon lights and soothing electronica music (see: Magnet Towers) but Blush just feels significantly more sophisticated. It's a browser game by Flashbang Studios, the same people behind the wonderfully funny and entertaining Minotaur China Shop. 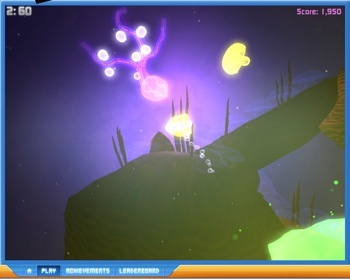 Instead of a rampaging creature from Greek myth, Blush has you play as ... a jellyfish. A glowing neon jellyfish, but a jellyfish nonetheless. The game is controlled entirely with the mouse (with B providing a temporary boost of speed), and revolves primarily around one of the things a jellyfish is best known for - its stinging tentacles. Your tentacles are very useful here: They can destroy enemy sea creatures and collect little floating eggs, though you'll have to whip around to get some good "oomph" to your strikes. Collect eggs, take them to collection points to grow faster and more powerful.